**I'm able to reach tomcat in the browser. I've done all the prep to be able to access the GUI apps, but I am still told I am not authorized. Below is a screenshot of my tomcat-users.xml file or I have it in code blocks below. I'm using Tomcat 8.5.14 for Ubuntu 16.04 Linux. I've also suitably allowed connections to manager and host manager apps via this method from someone's post on a similar question. Now on the tomcat portal in browser I get prompted for password when trying to access the manager app or the host manager app but inputing the information from tomcat-users.xml and hitting "OK" just loops me to putting in my information without doing anything. When I escape the password prompt, I just get sent to an "error 401 unathorized page" for both manager app and host-manager app. What gives? I cannot figure out what I'm doing wrong even after hours of testing. 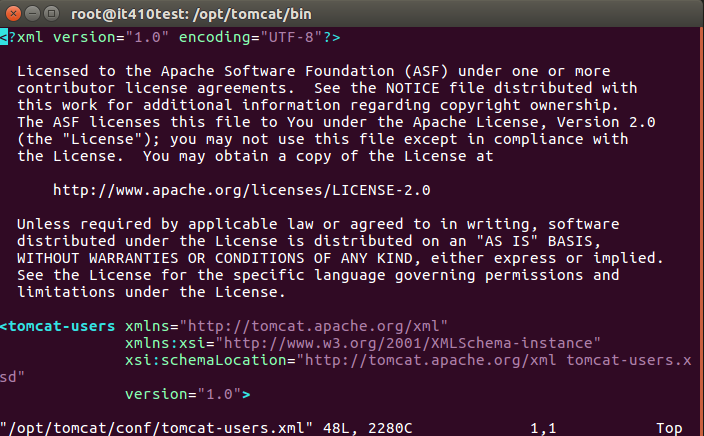 Browse other questions tagged tomcat apache2 tomcat8 or ask your own question.